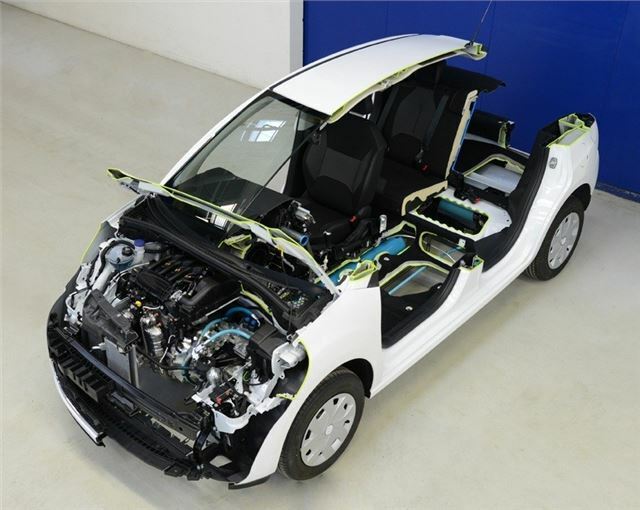 PSA (Peugeot and Citroen) has announced a new economy technology which uses compressed air to drive the engine. It’ll be premiered at the 2013 Geneva Motor Show, and promises reduced emissions, with a zero-emissions mode designed to comply with proposed CO2 free future town centres. The system, called Hybrid-Air, combines a 1.2-litre three-cylinder petrol engine with an air compressor, which compresses air as the engine runs. The air can then be used to assist in turning engine, specifically in situations where extra strain would be put on fuel consumption, such as when moving off or accelerating. The system can be set in three modes – Air, Petrol and Combined. In petrol mode the car is driven by the 1.2-litre engine as normal – it’s the best mode for driving out of town and on A-roads. Changing to combined mode gives a blend of petrol drive and assistance from the compressed air, while Air mode uses compressed air alone, making the car run with zero tailpipe emissions. Air mode is designed for proposed emission free zones, in which combustion engines would likely be banned. In current models the system delivered 97.4mpg on the combined cycle, which equates to emissions of 69g/km. Peugeot will premiere the Hybrid Air system at the Geneva Motor Show, fitted to a 2008 crossover, while Citroen will display the system in a C3 hatchback.